In a mind blowing gesture CR7 proved that he has a heart of gold and cares for his adoring fans. 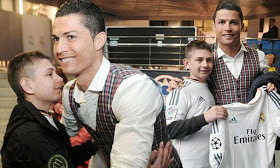 This was fully displayed when a young Cristiano Ronaldo fan who woke up from a coma was given the treat of a lifetime. 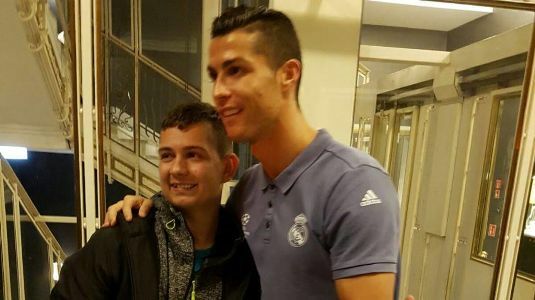 The boy from Poland had the time of his life on Tuesday as he met up with his idol Cristiano Ronaldo, who helped him 'wake up from coma' back in 2014. A rock-solid fan even unconscious. David, a young Real Madrid/Cristiano Ronaldo fan in 2013, had a bad accident while riding a bike and was in coma for three months. An amazing new coma recovery treatment. His family enlisted him in a hospital that tested a new method of recovery from coma leading the doctors in the hospital to suggest that David should listen to commentaries of Real Madrid's games and Ronaldo's voice since everyone knew he was a huge Ronaldo supporter. Three months later, David miraculously woke up at the exact moment he was listening to Cristiano Ronaldo scoring his third goal for Portugal against Sweden in a World Cup playoff. A double treat for his adoring fan. Ronaldo invited David to Madrid as his special guest to watch a Champions League match against Borussia Dortmund in April 2014, on Tuesday the football star showed his kind side once again as he invited the young lad and his parents to Real Madrid's team hotel in Poland where Real Madrid will face Legia Warsaw (a Polish club) in the Champions League . Football really can be a life transforming Force.